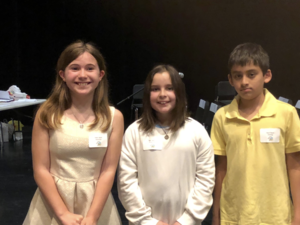 FAIRFIELD, CONN. – On Monday May 14, students from Fairfield, CT participated in the 36th Annual Townwide 5th Grade Spelling Bee. Each elementary school in town hosted its own mini Spelling Bee to down-select to 35 fifth graders who then competed for top honors at Roger Ludlowe Middle School. Continuing a three-decade tradition, the Junior Women’s Club of Fairfield once again hosted this fun and inspiring event, which kept audience members on the edge of their seats as the classroom winners stepped up to the microphone to out-spell their opponents. The top three winners received special prizes donated by the Fairfield JWC and several corporate sponsors, including nylon backpacks donated by Kumon Downtown Fairfield and a generous gift certificate donated by Saugatuck Sweets for the 1st place winner -- 2-scoops of ice cream per week for 3 months – just in time for summer! Other generous sponsors included Bankwell and the People’s United Bank. The JWC was excited to welcome back returning judge John Kovach, Editorial Director at HAN Network, as well as welcome new judge, Tamara Lyhne, Head of Children's Services at the Fairfield Public Library. Jen Hinkle and Cheryl Eustace, both members of the JWC of Fairfield, did a superb job of reading the many rounds of words to contestants, while other members provided additional onsite support for the event. In addition to the Spelling Bee, the JWC of Fairfield hosts a “A Visit to Santa’s House” in December, the proceeds of which benefit the club’s charitable CARE partner, as well as local scholarship recipients. The club also hosts community service projects and social events throughout the year. To learn more about the club, visit www.jwcfairfield.com. The club can also be found on Facebook. From right to left: First Place winner Emily Heath (Riverfield Elementary School), Second Place winner Mia Linardy (Riverfield Elementary School), Third Place winner Ryan Souza (Jennings Elementary School).